Friends coming for drinks? Short on time? 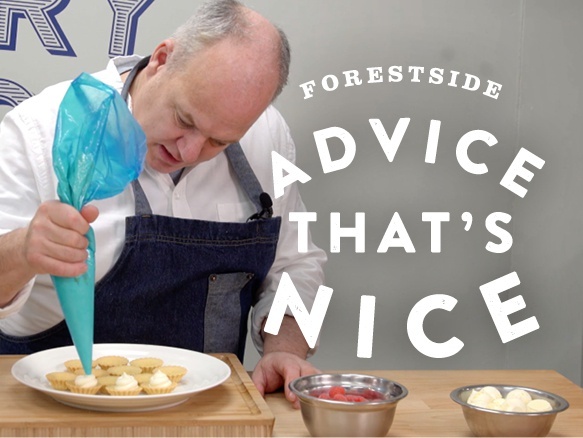 Our amazing Forestside expert chef – Stephen Jeffers – has some delicious show-stopping canape ideas which can be made using just a few ingredients and in just a few minutes! Check out the Forestside vlogs below for some great ideas this Christmas. Advice That’s Nice. For a delicious show stopping canape over Christmas and New Year, just try these simple to make little skewers! Simple to make, few ingredients and a true showstopper! For delicious little bites of scrumptiousness try out these easy little sweet canapes over Christmas. Quick and easy to make, only a few ingredients but sure to wow you and your guests! Using only a few ingredients Chef Jeffers creates a delicious little mouthful that is sure to wow your guests! Visit the Forestside website for more information on Stephen Jeffer's recipes.